Crowdfund hardware for your Code Club! Ever wished your Code Club could have a go at programming hardware and playing with electronics? Well now they can! Obviously we don’t have the funds to buy hardware for the 2100 Code Clubs that exist but we can certainly give you the tools to raise that money yourself. We’ve teamed up with Hubbub to create a platform that helps you raise money to buy hardware for your Code Club. You can read about it in a lot more detail here where we have recommended hardware and have some further notes on how to get the word out about your campaign. Good luck! So open! Much access! All of the Code Club projects are online! 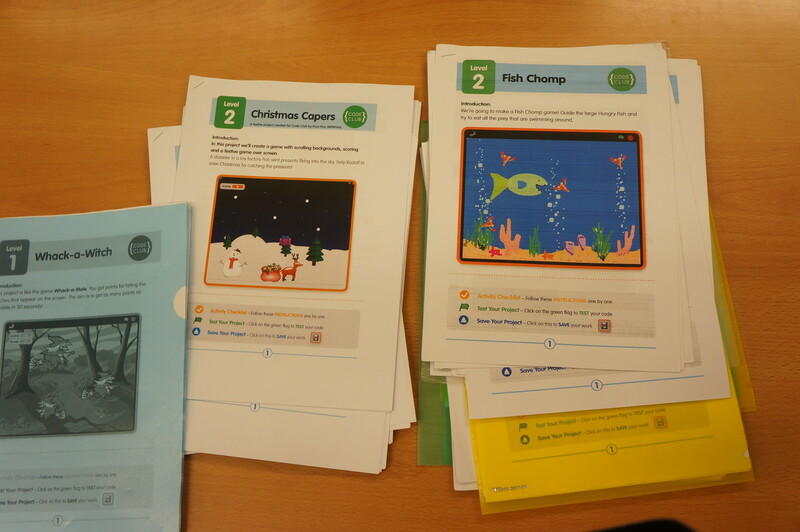 We are super pleased to announce that all the Code Club UK projects are now available online. If you’re a parent or teacher, you can start using the materials now, without registering a club. If you’re curious about running a club, you can look over all the materials before you make a decision, but If you want to run a Code Club, you’ll still need to register with us. We’ve done this to help more kids learn and create on a computer. Not everyone is lucky enough to have a Code Club yet, but many children do have access to a computer at home or in the classroom. The projects are aimed at 9 to 11 year olds, but there is no reason why younger children and grown ups can’t learn too. Although we’re releasing our projects today, they’ve been developed in the open for the last year, and we want to thank each and every one of the volunteers who have helped us with new projects, translations, and each and every typo fixed. We’re hoping that now the projects are open for all, it will be more tempting to start new Code Clubs. We are really looking forward to seeing our projects being used by as many people as possible, and hope you can help spread the word on their new found openness (and if you find a mistake, or have a new idea for a project, come and join us on GitHub: http://github.com/codeclub). At the moment we have four terms worth of awesome projects. Two terms of Scratch projects, a term of HTML & CSS projects and a term of Python projects. We’re really proud of them so far — so proud that we are shortly going to take them out from behind the sign up wall so that anyone can enjoy them. You will soon be able to use these with your children at home, in class, or anywhere you see fit. YAY! More news of this to follow. We’ve been trying our best but we’ve got a little bit behind schedule. By now we should have another term of projects ready for the 120 clubs that started in September 2012 but we haven’t quite managed it. We are so sorry but don’t do a huge sadface just yet – whilst you are bearing with us there are awesome things you can be doing with your club that don’t require any further hardware or resources, why not try Mozilla Webmaker tools, Blockly or Appinventor? Let us know if you find any other great resources. If you want to get started with hardware we now have a crowdsourcing platform for you to raise money for your school: https://codeclub.hubbub.net/ We recommend getting started with an arduino kit, but it’s up to you what you want to do. Why not ask your club what they want to hack next? 1. Making your own projects and uploading them to share with others – go to https://github.com/codeclub, pull requests make us super happy :) Some of the lessons volunteers have made include Flappy Parrot and Christmas Capers. 2. Applying for our Head of Curriculum job and helping us get up to speed.